Marrickville is a suburb buzzing with Vietnamese restaurants; some of them sub-standard, some of them average and some of them wonderful. Bau Truong falls into the latter category. 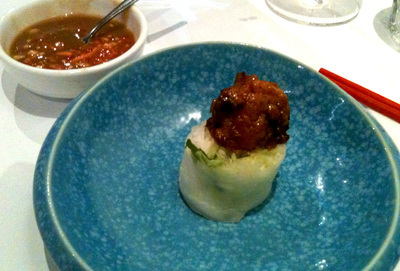 Located on Marrickville Road, Bau Truong is a slick restaurant which serves fine dining Vietnamese. The extensive menu includes share plates as well as unusual main courses that wouldn't be found on the menu of a typical Vietnamese restaurant. 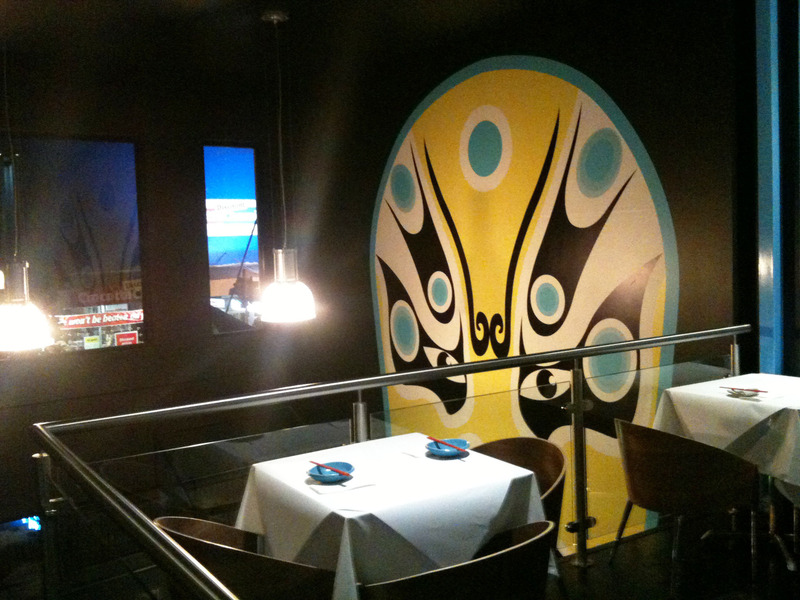 It's an ideal setting for a dinner with friends or family. My visit was a mix of both: my mother, my close friend and her mother (also my mother's close friend). None of us holds back when it comes to eating and we thus chose a large selection of share plates and mains. The menu focuses heavily on meat based dishes (from the usual to the unusual), as well as seafood, soups, noodles and vegetarian dishes. It suited our dietary requirements, as my mother is gluten intolerant and I'm a type 1 diabetic. The dishes explode with flavour. The meatball rice paper rolls are fresh, tasty and enhanced by the accompanying herbs and peanut sauce, an excellent starter to get the tastebuds salivating. 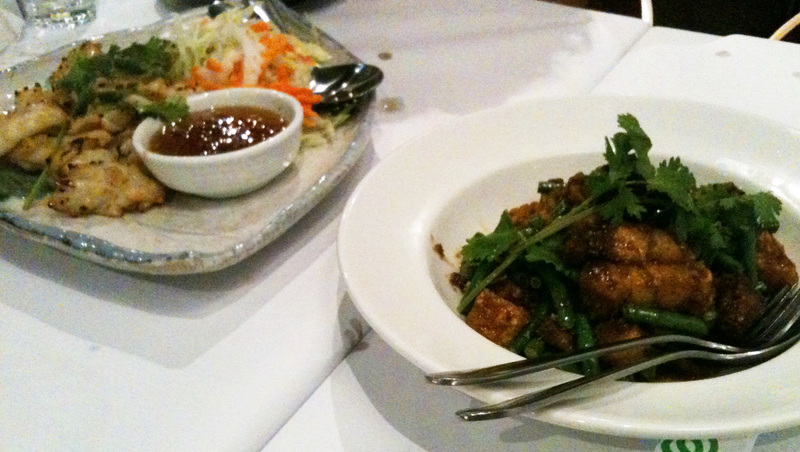 The 'Fishing village-style garlic and chilli grilled squid' was perfectly cooked, as was the pork belly, both dishes beautifully seasoned and lovely to eat with the small bowls of rice we ordered. 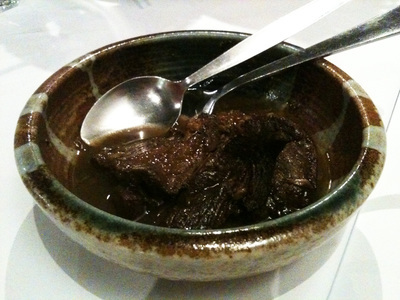 I had my reservations with the 'Ox tongue braised in red wine', but was pleasantly surprised. The tongue was soft and tender, in a strong sauce, a dish for those who like powerful, meaty flavours. The smoked duck was delicious, a beautiful combination of moist duck, mint, fresh fruits and chilli. 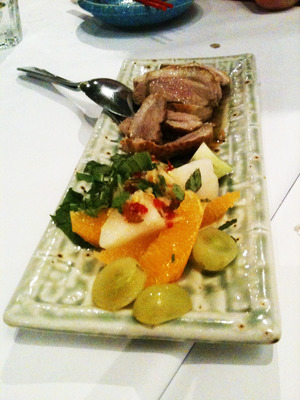 The fruits combat the fattiness of the duck, resulting in a refreshing dish. 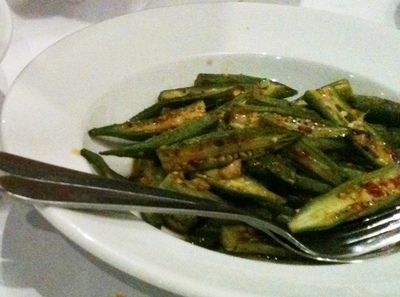 Our only vegetarian dish, okra with garlic and chilli, was crisp and light. It's hard to stop eating, despite its strong hit of chilli. For those who don't respond well to chilli, it would be best to ask for a moderate dish. The stirfried chicken with onions, lemongrass and (a lot of) chilli and the stirfried pipis were not as impressive as the other dishes. 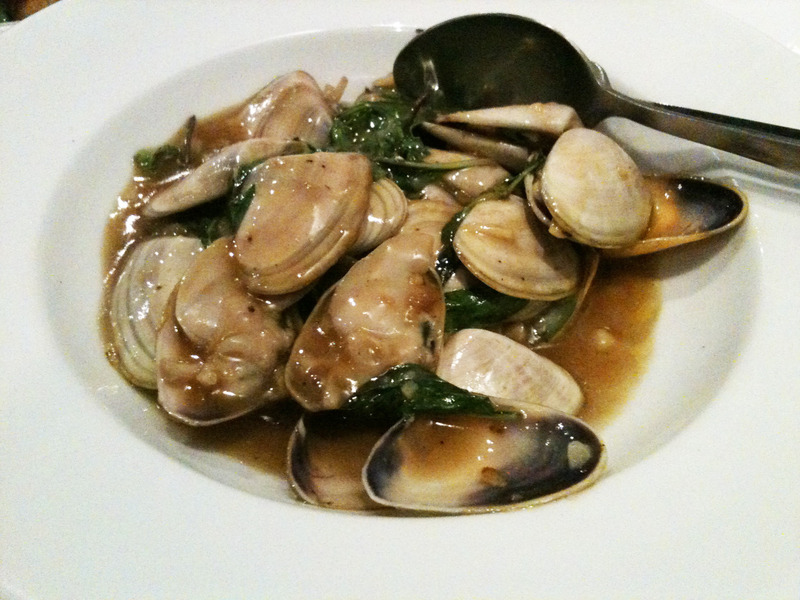 The sauces were what let the dishes down: too gluggy, overpowering the beautiful flavours of the chicken and pipis. The restaurant accepts BYO with a $4 corkage charge per head, yet they also have a well priced wine list. We chose a Grant Burge white and a Rutherglen white, both of which suited the dishes. Bau Truong is not a restaurant one goes to for cheap, tasty Vietnamese, but rather for masterful versions of traditional Vietnamese dishes. I can't wait to return and try the grilled quail, the golden fried soft shell crab, the whole steamed barramundi, the stirfried crocodile and the list goes on.